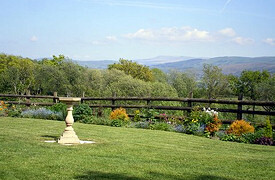 Bryndolau, Cwmifor, Llandeilo, Carmarthenshire, SA19 7AT, U.K.
"...We have found peace, healing and the restoration of our energies here..."
Retreat Garden. As keen gardeners, we have developed the garden from a blank canvas and it is constantly evolving. Our challenge is to balance our passion for plants with a programme of easy maintenance and all-year round interest. 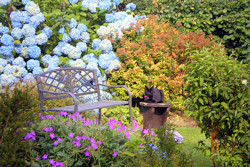 Our style is simple borders and beds mainly featuring traditional cottage garden plants. 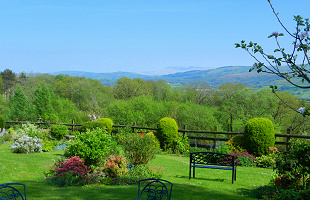 We are members of The Retreat Association: www.retreats.org.uk and, during the summer months, the garden at “Bryndolau” is open to visitors to enjoy the sweeping valley views to the Brecon Beacons. 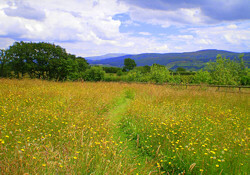 You are welcome to follow our mown field paths to explore the wildlife pond and orchard. 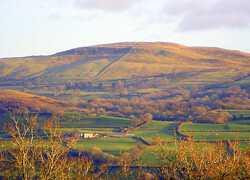 There are places to sit at various vantage points to make the most of the views. Plants from our garden are regularly for sale. Tea and coffee are available on request. There is no admission charge, but donations can be made to St. Paul’s, Manordeilo church funds. In our meadow sits our Shepherd’s Retreat Hut (Encil y Bugail). Here, visitors are welcome to rest awhile to read and enjoy the peaceful surroundings. We are able to offer facilities for quiet retreat days/group gatherings for up to fifteen people who wish to follow their own programme. Refreshments/light lunches can be provided. Please contact us for our daily charges.